After a three-year NHL hiatus, Vladimir Sobotka finally returned to the St. Louis Blues on April 7. They signed a three-year contract extension with the 29-year-old worth $10.5 million. With the NHL Expansion Draft looming, the Blues must ensure that they protect “the little guy with gumption” from the Czech Republic. After spending three seasons back and forth between the Boston Bruins (drafted 106th overall in 2005) and their AHL affiliate in Providence, Sobotka was traded to the Blues in exchange for the rights to prospect David Warsofsky. The following season he would score his first career goal with the Blues against his former team and go on to accumulate 29 points in 65 games. In the 2011 off-season, the Blues signed Sobotka to a three-year contract extension worth $3.9 million. The gritty forward would average 24 points a season in his next three years, scoring a career high-33 in 2013. While he was never a huge goal scorer or point producer he was valuable to the club in other ways. He led the NHL with a 61.9 percent face-off winning percentage and ranked fifth on the team with 110 hits in only 61 games in 2013. Contract talks began midway through 2013, but negotiations fizzled out as rumors of a KHL departure loomed. General manager Doug Armstrong told the St. Louis Post-Dispatch that he put a premium on the things Sobotka did that did not show up on the stat sheet. Armstrong and the Blues took the rumors in stride and tried to work out a deal. In March 2014, Sobotka fired his agent Petr Svoboda. He hired Stephen Bartlett, then in July, fired Bartlett and oddly enough hired another agent named Petr Svoboda. The agent carousal only complicated matters and on July 6, 2014 Armstrong filled for arbitration in hopes to speed up the negotiation process. According to Svoboda-agent number two, the Blues would not budge from a one-year,$2.7 million dollar offer. Sobotka was seeking $3.0 million and felt that he was worth more than what St. Louis offered. The arbitrator granted the $2.7 million dollar offer and he decided to leave for the KHL over the $300,000 dollar difference. Across the pond Sobotka went, inking a 3-year deal that paid him a total of $8.5 million. Over his three years with the Avangard Omsk, he scored 37 goals, racking up 102 points in 138 games. As we know, the rink is bigger, and competition throughout the league top to bottom doesn’t compare to the NHL, but it is undoubtedly the next best hockey league in the world. 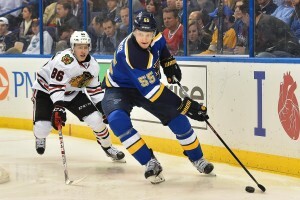 Sobotka is a gamer, and with an increased offensive role in his time with Avangard, Armstrong and the Blues believe that he has developed into more of a point producing player. 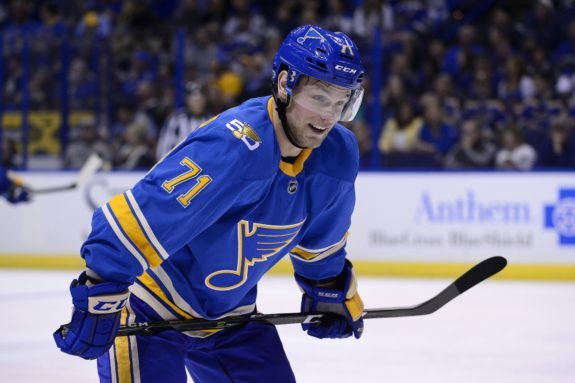 While it’s clear that Sobotka did desire to return to St. Louis, the situation became complicated due to the fact that he would have had to buyout his contract with Avangard. The buyout would have nearly totaled his $2.7 million dollar salary for the Blues and Sobotka would have essentially played for free. On April 7 of this year, Sobotka would make his return to the St. Louis, inking a three-year, $10.5 million contract. His final season with Avangard concluded on March 30, but the contract did not expire until April 30. 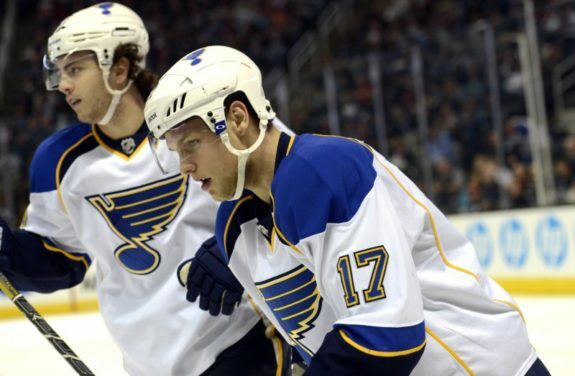 Sobotka and Craig Oster, (his fourth agent since his first stint with the Blues) worked out a deal that terminated the contract early and allowed him to re-negotiate with the Blues. Many were surprised that the Blues gave the 29-year-old a three-year contract extension. However, neither Sobotka nor the Blues were interested in a short-term deal. St. Louis would have been happy to get the same player they lost in 2014, but Armstrong and the Blues believe they re-signed an even better version than the 2014 Sobotka. In his NHL return he immediately made a difference, scoring a goal in the season finale against Colorado. Sobotka gave St. Louis a go-ahead goal in the third period to help them win the game 3-2. In a series nobody believed the Blues could win, Vladimir Sobotka shined. In Game 1, he scored in his second straight game, playing 32 shifts for over 21 minutes of ice time. He added assists in Game’s 3 and 5 and it was clear that he was making a difference. Behind great defense and the heroics of goaltender Jake Allen, the Blues defeated the Wild in five games. Sobotka didn’t stop making his presence known after the first-round. He added another goal and two more assists against Nashville to finish the playoffs with six points (tied for third on the team). Not only did he add tallies in the scoring column he contributed in many other ways as he always has for the Blues. He is as strong on the puck as NHL forwards north of 6’0″ and being listed at a generous 5’10” Sobotka is surprisingly physical and can fend off just about any defender. Watching him this postseason it was evident that the Czech has improved his overall game, especially his offensive skill set. The Blues were eliminated in six games and for Sobotka, it was his second time being eliminated this season. However, he is not going home to reflect on his crazy year. He will join his native Czech Republic in France to play in the World Ice Hockey Championship. At this rate, there isn’t an ice rink on the planet that is off limits. The end of the tournament on May 21 will mark nine straight months of hockey for Sobotka. Before the Blues can look towards next season, they and all of the 30 other NHL franchises must first decide which players they want to protect in the NHL Expansion Draft. The Las Vegas Golden Knights will make their selections by 5 p.m. ET on June 20. Current NHL teams will need to submit their selections by June 17. Each team must protect seven forwards, three defensemen and one goalie; or eight skaters total and one goalie. Any player with a no-trade clause in his contract must be protected. That player can elect to waive it, though. All first and second-year players and unsigned draft picks are not eligible to be selected by Las Vegas. The Blues should elect to go with the seven-three-one method, to ensure they protect their core group of forwards. You won’t find young talents, Robby Fabbri, Zach Sanford, Ivan Barbashev, Jordan Schmaltz, or Colton Parayko on the list as they are all exempt from the draft. Obviously, Vladimir Tarasenko, Alexander Steen, Paul Stastny, Jaden Schwartz, and Patrik Berglund will be protected. The decision is relatively easy for the defensemen as the Blues will protect: Alex Pietrangelo, Jay Bouwmeester, and Joel Edmundson. Jake Allen is now the goalie of the future, so the question becomes which two remaining forwards will the Blues protect? Armstrong will have to choose between Sobotka, Jori Lehtera, Dmitij Jaskin, Nail Yakupov, Ryan Reaves, David Perron, and Kyle Brodziak. Yakupov is a promising young project, but he is not worth protecting. Brodziak will be left exposed as Las Vegas will not look to acquire his forth line services. Jaskin came out of nowhere and played hero for the Blues in game five against Nashville, but his overall body of work does not constitute a protection. That leaves Sobotka, Lehtera, Reaves, and Perron — this is where it becomes tough. The Blues may elect to leave Reaves unprotected and use one of their eight 2017 draft picks to bargain with if Las Vegas desires to choose him. After Perron’s underwhelming postseason performance, the Blues may leave him unprotected and be okay giving up his $3.7 million dollar salary, leaving Lehtera and Sobotka to be the final players the Blues protect. Had Sobotka not returned or been exempt, Perron would most likely be included on the list. Even though Sobotka only played in one game this regular season he still meets the criteria on whether or not a player must be protected. Per Capfriendy.com, As long as a player has three years under a standard player contract he must be protected — Sobotka has nine years, so he fits the bill. The Blues must protect Sobotka. His peskiness in the offensive zone, his grit on the defensive end, his faceoff ability and his new found point scoring skill set gives the blues a must needed depth center for the next three years. He is a jack of all trades with the ability to play on the power play and on the penalty kill. It needs to be the Blues top priority to make sure the “little guy with gumption” doesn’t slip away again.